When Little Miss Muffet sat down to eat her curds and whey (cottage cheese, made up of lumpy curds and milky whey) she was dining on a rich combination of of healthy nutrients. Whey protein, which makes up 80 percent of the protein found in human milk, contains all the essential amino acids to match our protein requirements and is easier to digest and absorb than other proteins. Whey is a complex ingredient made up of lactose, fat, minerals and protein; and the protein is made up of many smaller protein subfractions -- beta-lactoglobulin, alpha-lactalbumin, immunoglobulins (IgGs), glycomacropeptides, bovine serum albumin (BSA) and minor peptides such as lactoperoxidases, lysozyme and lactoferrin. Each of these subfractions has its own unique biological properties. Separating these subfractions on a large scale was prohibitively expensive until recently. Modern filtering technology has improved dramatically in the past decade, allowing companies to separate some of the highly bioactive peptides - such as lactoferrin and lactoperoxidase - from whey. There's been a steady growth in consumer awareness of the benefits of protein in sports performance, weight management, lean muscle mass retention, satiety and general well being. Recently, researchers at Washington State University found whey protein may help lower systolic and diastolic blood pressure in young, pre-hypertension individuals, reports WholeFoods Magazine (see below). "As this awareness grows, so does the need for consumer products that deliver these benefits, and more importantly taste great," says Carrie Schroeder, category marketing manager for functional nutrition at Fonterra USA Inc., Rosemont, Ill. Highly functional protein ingredients are well placed to not only deliver on the promise to consumers but will allow manufacturers to responsibly market the benefits." Whey Protein Concentrates: First generation whey protein powders contain as low as 30-40 percent protein and high amounts of lactose, fat, and undenatured proteins. They are categorized as a whey concentrate and are used mostly by the food industry for baking and other uses. Modern concentrates now contain as high as 70-80 percent protein with reduced amounts of lactose. This is achieved through ultra-filtration processing, which removes lactose, thus elevating the concentration of protein and fat in the final product, reports Men's Total Fitness. Whey Protein Isolates (WPI): WPIs generally contain as much as 90-96 protein. Research has found that only whey proteins in their natural undenatured state (i.e. native conformational state) have biological activity. Processing whey protein to remove the lactose, fats, etc. without losing its biological activity takes special care by the supplier. Maintaining the natural undenatured state of the protein is essential to its anti-cancer and immune-modulating activity, so the protein must be processed under low temperature and/or low acid conditions so as not to "denature" the protein. They contain minimal lactose and virtually no fat. With the array of more recent processing techniques used to make WPIs-or pull out various subfractions -such as Cross Flow Micro filtration (CFMTM), ultra filtration (UF), micro filtration (MF), reverse osmosis (RO), dynamic membrane filtration (DMF), ion exchange chromatography, (IEC), electro-ultrafiltration (EU), radial flow chromatography (RFC) and nano filtration (NF), suppliers now make very high grade and unique whey proteins. Schroeder says the emergence of functional foods and beverages that specifically target baby boomers is likely to be a key area of innovation. "As baby boomers age, health concerns including heart disease, diabetes, cancer, physical mobility and the loss of lean muscle mass (sarcopenia) become priorities," she says. "This large and valuable consumer group is actively seeking vitality through products that meet their changing nutritional needs and fit in with their lifestyles." And she adds, "There is emerging science supporting the need to evenly spread protein consumption across the day in order to optimize muscle protein synthesis. This synthesis is critical to prevent sarcopenia and ultimately loss of physical mobility. Whey protein, due to its high levels of leucine [which stimulates muscle protein synthesis] is particularly well placed to target sarcopenia." Fonterra's ClearProtein 8855 delivers the sought-after nutritional benefits of whey protein without compromising on taste, clarity and stability. 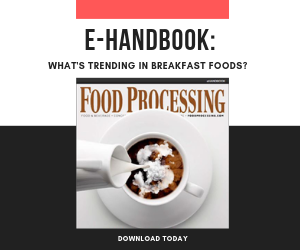 Looking ahead, she says, "We anticipate an increase in the number of whey protein based products that target different meal occasions such as breakfast and lunch; as these are the occasions where protein is often lacking." In January, Grande Custom Ingredients Group Lomira, Wis., introduced Grande Ultra Whey Protein Isolate (WPI). Containing essential amino acids, this fat-free and lactose-free ingredient is specifically designed for beverage applications requiring complete product clarity and a clean flavor. Finished products have lower astringency, a neutral flavor and clarity. The Grande system includes a strict chain that extends from the Grade A dairy farm through the production of natural white Italian cheese and Grade A whey proteins. "Consumers have a desire to consume protein fortified beverages, but don't always want a milk shake type texture, which most manufacturers are producing today," says Applied Technology Manager Jeff Banes. "Grande's Ultra WPI allows manufacturers to create refreshing, clear, fruit flavored beverages that are easy to drink and quench your thirst, in addition to providing protein." Hilmar Ingredients, a division of Hilmar Cheese Co., Hilmar, Calif., prides itself on the prototypes it develops. "We developed six popular beverages that demonstrate our whey's nutritional and functional advantages in different beverage types," says Gwen Bargetzi, director of marketing. "We are also selling them only at the Know Whey Bar located in our Visitor Center Café. "It's a great way to introduce the general public to whey in tasty, nutritional beverages -- we get lots of visitors since our California location is the world's largest single-site cheese and whey manufacturing plant. Plus our staff members frequent the Café. We're hoping to improve their beverage choices from Red Bull and Coke to a protein-fortified smoothie or high protein clear sport drink." Researchers at Washington State University found that whey protein, often associated with physical fitness and muscle growth, helps lower systolic and diastolic blood pressure in young, pre-hypertension individuals, reports WholeFoods Magazine. The study, which grouped young men and women 18-26 into groups according to their blood pressure, found those with normal blood pressure were unaffected by consuming 28g of either hydrolyzed or non-hydrolyzed whey protein beverage, and their blood pressure neither rose nor fell during the course of the study. Groups with high blood pressure, however, experienced an 8.0 and 8.6 decrease of systolic and diastolic blood pressure, respectively. These improvements began in the first week and continued throughout the duration of the six-week study. These findings have positive implications for consumers and the dairy industry alike, and could potentially facilitate a boom in the market demand for whey protein. Biochemist and lead researcher Susan Fleugal, says that such marked decreases in blood pressure can "reduce cardiovascular disease and bring a 35 to 40 percent reduction in fatal strokes." And since cardiovascular disease is the leading killer of women and men in the U.S., these findings are compelling and significant. A new generation of whey products known as Bioactive Whey Fraction (BAWF) protein has the potential to be a worthwhile addition to an athlete's diet, reports Men's Health. This innovative ingredient contains far higher total growth factor levels comprised from IGF-1, TGF-1, and TGF-2, higher levels of various phospholipids and various bioactive lipids, such as conjugated linoleic acid (CLA), phosphotidyl-serine (PS), phosphtidyl-choline, (PC) sphingomyelin, and higher levels of immunoglobulins and lactoferrin than other whey proteins. Current studies suggest these compounds can improve immunity and intestinal health, and have many other effects that both athletes and less active people alike may find beneficial. When comparing a BAWF protein to a typical concentrate (e.g. WPC 80), the BAWF protein has 350 percent more lactoferrin, 400 percent more CLA, 200 percent more PS more and PC and 150 percent more IGF as found in the concentrate. The differences are even larger between BAWF protein and an isolate as isolates have only trace amounts of PS, PC, and CLA.